Since the fall of the Soviet Union, which governed Uzbekistan as a satellite state, the country had had only one ruler: Islam Karimov, a strong-armed, unapologetically clannish dictator. He died in 2016 and was replaced by Shavkat Mirziyoyev. Shortly thereafter, Mirziyoyev announced reforms meant to open the country up to the outside world economically. He cultivated ties with potential patrons, including Russia, Europe, and China. More important, he began to improve relations with other Central Asian states. Cross-border disputes related to access and usage of energy and water resources are gradually being solved. Today, Uzbekistan has all the appearances of a country on the rise. It is prosperous and stable by the standards of the region. But appearances can be deceptive. Beneficial though Mirziyoyev’s reforms might be, their uses are merely counterfeit. The cool logic behind them is that they help Mirziyoyev consolidate power and endear him to his subjects. In a place such as Uzbekistan, the tactics a leader use may be liberal or draconian, but the outcome is the same: Uzbekistan is not going to be anything other than a centralized state where the president has great power. Did liberalization open up the country to external markets? In theory, yes. In practice, no. Mirziyoyev does support trade. He visits the countries with which Uzbekistan trades, provides platforms for solving problems, participates in organizations such as the Commonwealth of Independent States, signs bilateral agreements, and reduces transit fees. But these practices precede him. In fact, Uzbekistan has a long tradition of trade. 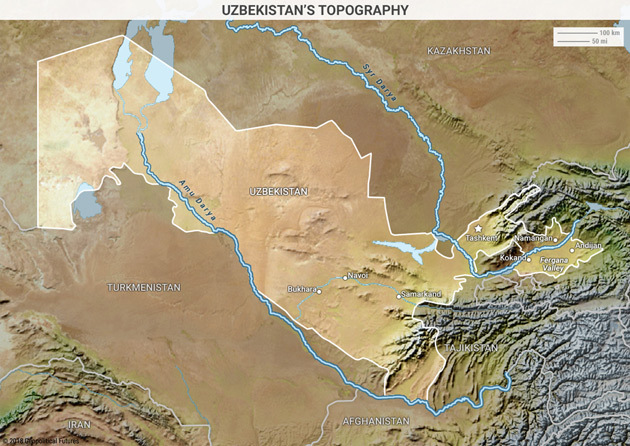 Like all Central Asian countries, Uzbekistan has no access to the sea but has nonetheless been a major trading center since antiquity. 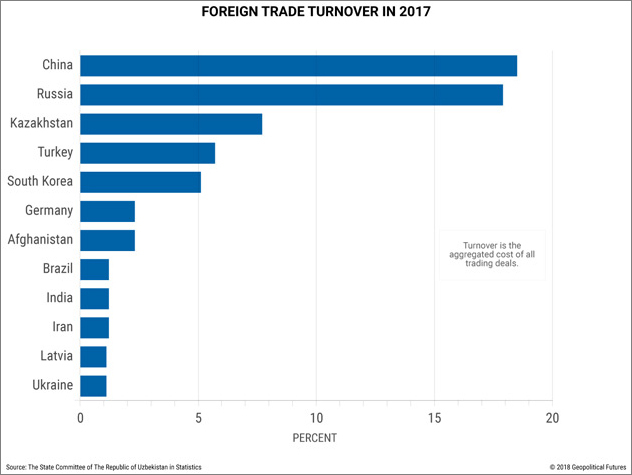 Trade created some opportunities for Uzbekistan, but it also created dependencies on its neighbors and on existing trade routes. China accounts for nearly 19% of Uzbek trade; Russia nearly 18%; Kazakhstan roughly 8%; and Turkey some 6%. These dependencies prevent the government in Tashkent from entering new markets. Has liberalization improved relations within the region? Yes and no. It’s no secret that under Karimov relations with the rest of Central Asia were tense and that Mirziyoyev inherited a number of Karimov’s problems in that regard. There have been territorial disputes, disputes over access to resources, and personal animosities among leaders. The president has indeed endeavored to resolve some of these issues. But his decision to make nice with the region is less of a paradigmatic shift and more of a pragmatic decision. His country is in a precarious position. It is not receiving as much money from Russia as it once was, thanks in part to Russia’s own financial woes. China is viewed with apprehension. Uzbekistan may be able to forsake one but it cannot afford to forsake both. Solidarity among its neighbors helps dampen the blow. Mirziyoyev’s reforms are less radical than they appear. He faces the same challenges Karimov did and he has largely responded to them as Karimov did. There is little to compel him to create the institutions necessary for liberal democracy. There are no real steps to develop the institutions necessary for a market economy. The only real reform has been the purge of the National Security Service—the main competitor to the government. The reforms in the financial sector and taxation are aimed at improving the business climate in the country and attracting foreign investments to Uzbekistan, not at opening up to new and better markets. Flashes of liberalization are not the same as fundamental, systemic changes.